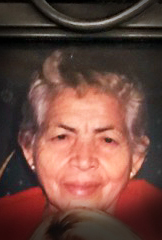 Mrs. Irma Platero, age 93, of Villa Rica passed away on Monday, January 28, 2019. She was born in El Salvador on Friday, January 1, 1926. Mrs. Platero was the daughter of the late, Miguel Jimenez and the late, Paula Carrillo. Besides her parents, Mrs. Platero is preceded in death by her husband, Daniel E. Platero. Survivors include her two sons, Nelson Daniel Platero of Douglasville and Guillermo Platero of El Salvador; her two daughters and one son-in-law, Irma Platero of Villa Rica and Amy and Carlos Velasco of El Salvador; Mrs. Platero is also survived by a number of other relatives. In accordance with the family’s wishes, Mrs. Platero will be cremated.